A truly excellent recipe for virgin strawberry daiquiris is difficult to come by. The alcoholic version of the drink, which was very popular during the 1980s, is a modern version of a classic Spanish cocktail that includes rum, lime juice and sugar. While the alcoholic version of this cocktail is delicious, it is also easy to make a non-alcoholic daiquiri that is perfect for people who don't like drinking or are not of legal drinking age. It is a wonderfully refreshing drink, particularly during the summertime, and it is great for picnics or barbeques. The berries are thirst-quenching and also pack some vitamins. Today, the daiquiri is a popular vacation and party libation, and you can see it being sipped on the beaches of Florida, at backyard summer grill parties and in bars and clubs across the country. The typical modern version is a blended drink with ice, fruit and rum. This concoction is usually sipped through a straw and garnished with the ubiquitous mini umbrella. Other popular garnishes include a slit fresh strawberry and even whipped cream! A virgin daiquiri is usually just a non-alcoholic daiquiri -- in other words, it just omits the rum. However, there are ways to make the non-alcoholic drink much more interesting with additions such as lemon-lime soda and fresh lime juice. 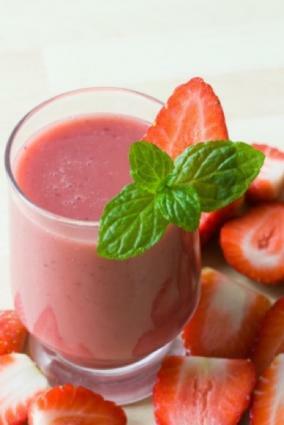 There are a variety of different recipes for virgin strawberry Daiquiris. Here are a few that will make your tastebuds sing. Fill your blender with the cracked ice. Add the lime juice, strawberries and sugar and blend until completely smooth. If the mixture is too thick, add a little water. When you're finished, pour the drink into a chilled glass and garnish it with a fresh strawberry. In a blender, blend the strawberries, sugar, lime juice and lemon-lime soda. Add the ice cubes and blend all the ingredients until they are smooth. If the drink is too thick, add more soda. Put the strawberries, sweet and sour mix, and ice cubes in the blender. Blend well until the contents are thick. Add grenadine syrup, and then blend again until everything is well mixed. If the drink is too thick, add some water. There are endless ways to serve a virgin daiquiri. You can serve it in a classic hurricane glass or a tall highball. You can garnish it with fresh strawberries or lime wedges. For fun, you can always add a kitschy umbrella or other decorations.